Sahara Bikash Bank Ltd. a Regional level “B” Class Financial Institution which has been rendering excellent service to its clients since 8 years and which has a vision to become one of the best State level Bank is looking for qualified, dynamic, self motivated, result oriented and competent personnel having a strong desire to excel in banking career with a “Can Do” attitude for the following job positions for corporate office and branch office, Sarlahi. Experience: Minimum 5 years of relevant experience in Banking and financial institution with sound Knowledge of Branch Handling, Credit, Accounting and finance. Selected candidates shall be placed into Head office. > Experience: Minimum 3 years of relevant experience in Banking and financial institution with sound Knowledge of Branch operation. Selected candidates shall be placed into Branch office Lalbandi, Ishwarpur and Barhathwa. > Experience: Minimum 3 years of relevant experience in Banking and financial institution with sound Knowledge of Account and Finance. > Experience: Minimum 3 years of relevant experience in Banking and financial institution with sound Knowledge of credit department. Experience: Minimum 3 years of relevant experience in IT field, Preferred experience in Banking and financial institution. should possess working Knowledge of Ms SQL, Oracle, My SQL, SQL, PHP, Dot Net (MVC), knowledge on Power BL, Share Point, Report Builder. Not exceeding 45 years for Manager level and not exceeding 40 years for officer level for male and additional five years for female applicant as at the date of vacancy notice. Must be Proficient in writing, typing in English and Nepali, Preference will be given to those having vehicle license and local candidates. The Branch Manager is responsible for the administration and efficient daily operation of a branch office including operations, lending, product sales and customer service in accordance with the Bank’s strategic goals. 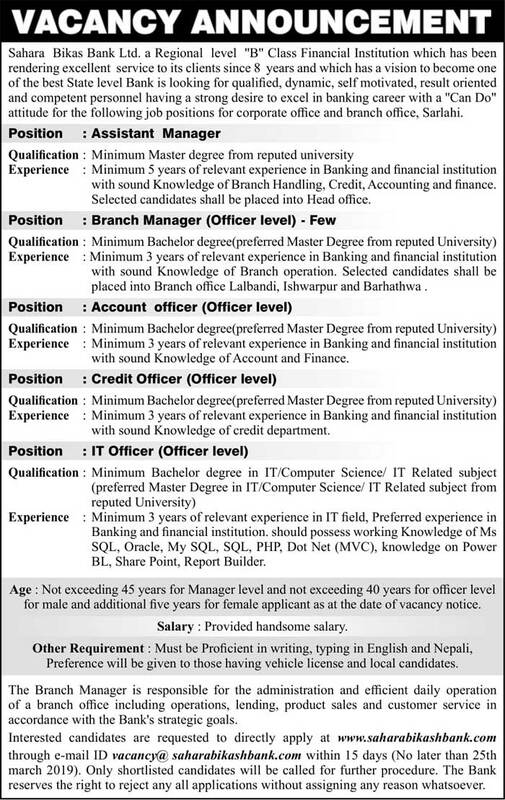 Interested candidates are requested to directly apply at www.saharabikashbank.com through e-mail ID vacancy@saharabikashbank.com within 15 days (No later than 25th March 2019). Only shortlisted candidates will be called for further procedure. The Bank reserves the right to reject any all applications without assigning any reason whatsoever.